Author: Tom Christie. Follow me on Twitter, here. Django's generic class-based view implementation is unneccesarily complicated. Simpler method implementations, with less magical behavior. Remember, even though the API has been greatly simplified, everything you're able to do with Django's existing implementation is also supported in django-vanilla-views. Although note that the package does not yet include the date based generic views. If you believe you've found some behavior in Django's generic class-based views that can't also be trivially achieved in django-vanilla-views, then please open a ticket, and we'll treat it as a bug. To review the full set of API differences between the two implementations, please see the migration guide for the base views, and the model views. For further background, the original release announcement for django-vanilla-views is available here. There are also slides to a talk 'Design by minimalism' which introduces django-vanilla-views and was presented at the Django User Group, London. 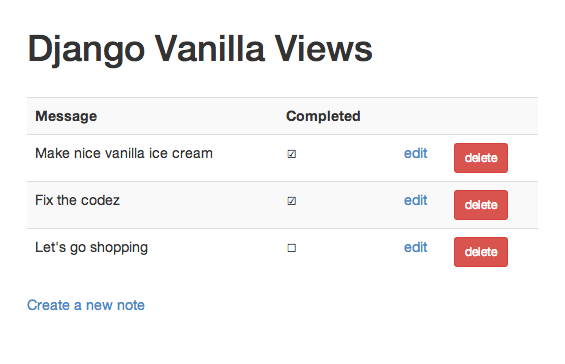 You can also view the Django class hierarchy for the same set of views that django-vanilla-views provides, here. Django Vanilla Views isn't just easier to use. I'd contest that because it presents fewer points of API to override, you'll also end up writing better, more maintainable code as a result. You'll be working from a smaller set of repeated patterns throughout your projects, and with a much more obvious flow control in your views. Import and use the views. To help give you an idea of the relative complexity of django-vanilla-views against Django's existing implementations, let's compare the two. The inheritance hierarchy of the views in django-vanilla-views is trivial, making it easy to figure out the control flow in the view. Here's the corresponding inheritance hiearchy in Django's implementation of CreateView. 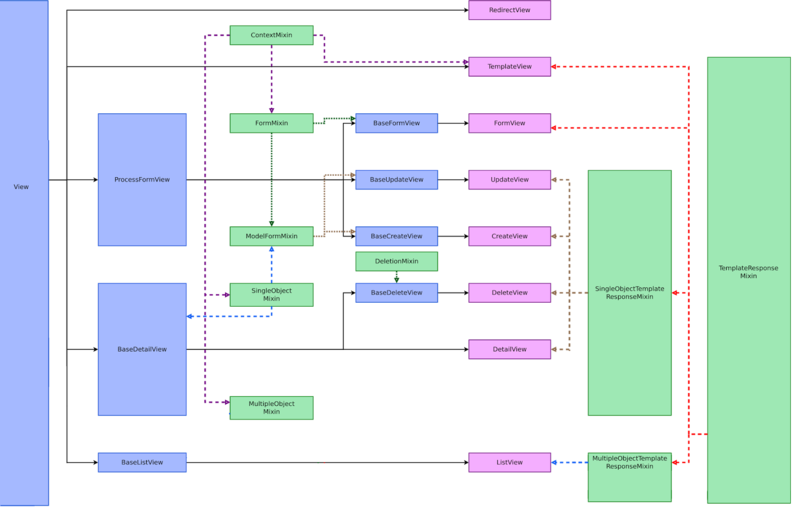 Let's take a look at the calling hierarchy when making an HTTP GET request to CreateView. Here's the equivalent calling hierarchy in Django's CreateView implementation. This repository includes an example project in the example directory. Open a browser and navigate to http://127.0.0.1:8000.